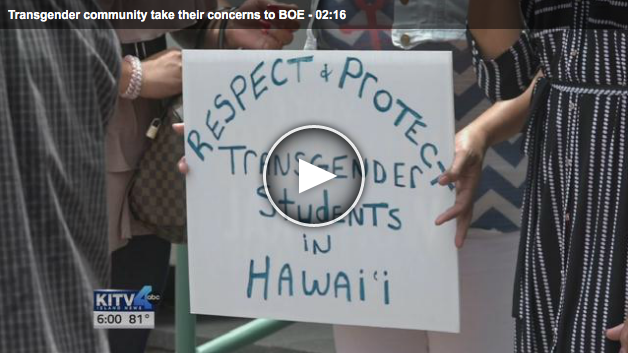 HONOLULU - Members of the transgender community delivered a petition to the Hawaii Board of education on Tuesday asking for guidelines and training in Hawaii schools for working with transgender students. Hina Wong-Kalu addressed the board, outlining what they sought in the petition, which over 5,400 people from around the world and Hawaii had signed. “Calling on your leadership and calling upon the Department of Education to ensure that respect and protection is afforded to all of our students within our public education system, especially with regards to our transgender students,” said Wong-Kalu. DOE officials say after six months, they have finally come up with a set of guidelines to deal with the issues. They are now being reviewed by the State Attorney General. Wong-Kalu and her group were pushing for guidelines in place by this graduation season. The DOE says it will be closer to the beginning of next school year.